Joseph E. Kauffman: deacon in the Salem Mennonite Church near Tofield, Alberta, was born in Johnson County, near Kalona, Iowa, on 7 March 1872, and died at Edmonton, Alberta, on 13 January 1968. He married Katie Yoder (1 January 1883-22 February 1973) on 23 December 1900. They had four sons and one daughter. Joseph Kauffman first moved from Johnson County to Parnell in Iowa County where he farmed until 1911. He came north to the Roundhill/Tofield area to look for land in the summer of 1911. He selected and purchased a half-section of land. In Iowa, March 1 was the traditional moving day for Amish Mennonites, and the Kauffman family came to Canada on 6 March 1912. Joseph Kauffman was ordained, by lot, to the office of deacon in the Salem Mennonite Church near Tofield, Alberta, on 28 September 1915. He served in that capacity for twenty-nine years with two bishops (Nicholas Roth and John B. Stauffer) and three preachers (Milo D. Stutzman, John K, Lehman and John B. Stauffer). His duties as deacon included administration of a special deacon's fund to help the poor and needy in the congregation. He also maintained the church membership lists, was involved in the discipline and correction of members, and assisted in communion and baptismal services. The Salem Mennonite Church baptized by the pouring of water on the baptismal candidates head. It was customary for the bishop to place his hands on the person's head and speak the appropriate words while the deacon poured the water. 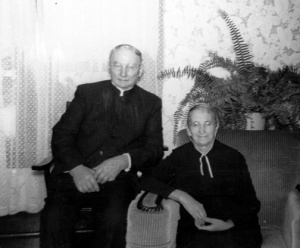 In 1944, at the age of 72, Joseph Kauffman retired from the office of deacon. He continued to live in retirement on the farm until moving to a nursing home in Edmonton in 1966. He died in Edmonton in 1968. Regehr, Ted D. "Kauffman, Joseph E. (1872-1968)." Global Anabaptist Mennonite Encyclopedia Online. December 2003. Web. 21 Apr 2019. http://gameo.org/index.php?title=Kauffman,_Joseph_E._(1872-1968)&oldid=88565. Regehr, Ted D. (December 2003). Kauffman, Joseph E. (1872-1968). Global Anabaptist Mennonite Encyclopedia Online. Retrieved 21 April 2019, from http://gameo.org/index.php?title=Kauffman,_Joseph_E._(1872-1968)&oldid=88565.